The dissolution of the Soviet Union in December of 1991 ushered in a wave of anti-Communist iconoclasm across Russia and former Soviet republics, in which public monuments were smashed, vandalized, buried, relocated, or sold off. 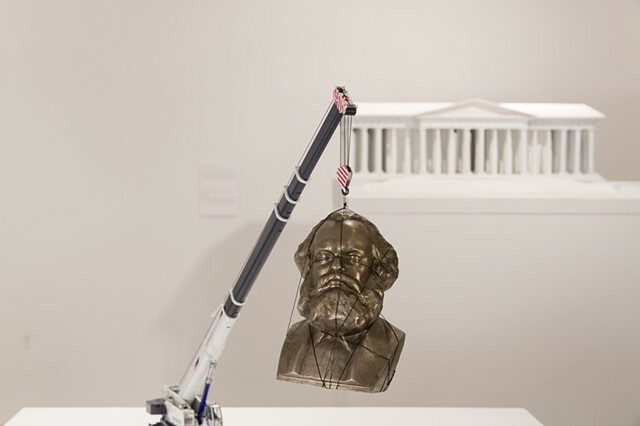 Invoking this strongly visual period of destruction in the early 1990s, and drawing from his own memory, Christoph Draeger's proposal consists of a crane suspending a statue of Marx. The artist presents a snapshot (in sculptural form) of the monument at the moment of its negation—an immortalized process of un-becoming. It then commemorates what is normatively historically erased: the violent disposal of historical ideologies necessary to ensure the transition to new regimes.